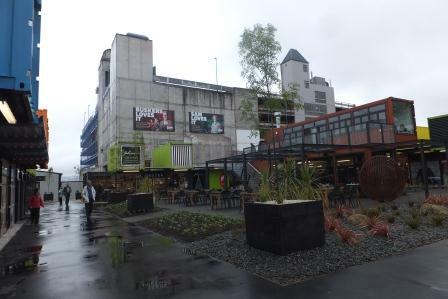 I had a couple of hours to kill when I was in Christchurch last week and decided to do a wee bit to help the economy. Ballantynes and Cashel Mall between Colombo Street and Oxford Terrace re-opened a couple of weeks ago and it’s looking good. The photo doesn’t do it justice. There are better ones here. The mall is colourful, welcoming and, most importantly for the locals, feels safe. The shop at the back is Johnson’s Grocery, relocated from Colombo Street. It’s lighter and more open than the old shop but it’s still got character. A couple of doors along is Scorpio Books which used to be one of my favourite haunts. It had a particularly good humour section which is wehre I found the complete collection of Calvin and Hobbes. The new container can’t fit the wide selection of books the old shop did but it’s still got the ambience that makes a book-lover feel at home. The mall’s not the way it was and there’s still a long way to go but it’s a very good start. 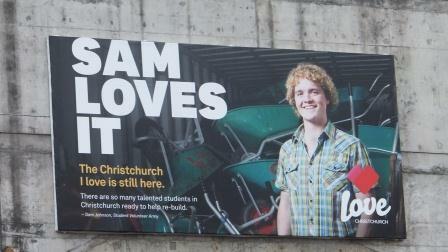 As Student Volunteer Army maestro, Sam Johnson, says: The Christchurch I love is still here. This entry was posted on Wednesday, November 16th, 2011 at 12:00 pm and is filed under building, business. You can follow any responses to this entry through the RSS 2.0 feed. You can leave a response, or trackback from your own site. Any decent restaurant or cafe in there?